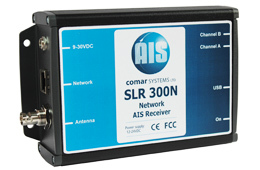 Now in a completely new enclosure and with an Ethernet and a USB interface, the SLR300N is an even better solution for use as a shoreside monitoring device. The SLR350N also includes a 90-265VAC/12VDC Universal Power Supply giving the user everything they need to plug and play. A low cost method of monitoring the position, speed and heading of other vessels within VHF range. The ability to plot the progress, changes in heading and speed of other vessels on the screen of an onboard PC or Chart Plotter. A vessels name, call sign and MMSI number to call up the target vessel on a DSC radio and ascertain their intentions.